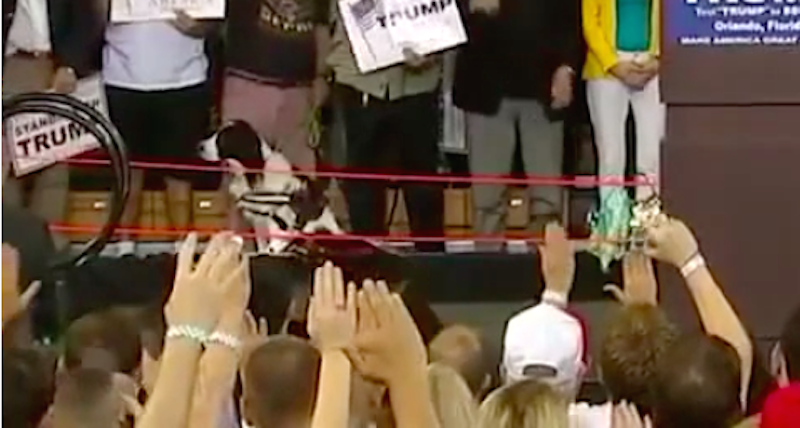 What we have here is some footage of a good boy such a good boy who’s my sweet little puppy boy yes you are who made his way into a Donald Trump rally in Florida over the weekend. The owner of this little pupperoo tried to make him raise his right paw and take the creepy Trump loyalty oath, but the pupperoo wasn’t having it. However, closer inspection of a YouTube video of the speech reveals that after this initial struggle, our proud pup basically acquiesced to his tyrant leader’s coercion. Sound familiar? That’s what it’s going to be like in America, too, folks.